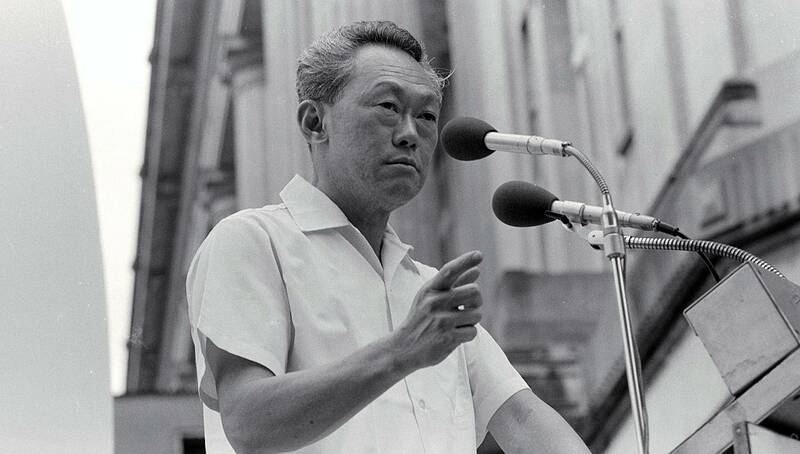 Lee Kuan Yew was the first and longest-serving Prime Minister of Singapore. It was his leadership that transformed Singapore from a third world country into a thriving metropolitan city in just three decades. In a press conference, referring to the airline pilot strike of Singapore Air, he said, “I have spent a lifetime building this (referring to the city of Singapore), and as long as I am in charge, no one is going to knock it down.” He was the leader Singapore needed, and it took him a mere 65 minutes to end the strike. Lee Kuan Yew was born in 1923 as the eldest child of Lee Chin Koon. He studied in the top schools in Singapore and went to the London School of Economics briefly for his university education before moving to Cambridge where he obtained his Law degree. He returned to Singapore, where he became a legal advisor to student and trade unions. Here he made many connections that would aid him in his political career later on. Lee started his political career under a Pro-British Progressive Party as an election agent. Soon after, he co-founded the People’s Action Party (PAP) with the aim of ending British colonial rule and attaining self-governance for Singapore. On 5 June 1959, Lee became the first Prime Minister of Singapore when PAP won the most seats in the legislative assembly. To end the British rule, Lee pushed for a merger with Malaysia. The Federation of Malaysia was formed on 16 September 1963, but the integration proved to be unsuitable for both sides. Just two years later, the then-Malaysian Prime Minister decided that Singapore should leave the federation. The choice to leave was the lowest point of Lee’s life, but also the turning point for Singapore’s success. Although Lee was in anguish at that point, he never gave up on his vision for Singapore. With Lee at the helm, an independent Singapore developed into the thriving metropolitan city it is today. After stepping down as Prime Minister in 1990, Lee served as Senior Minister and then Minister Mentor in the government, advising the country’s new generation of leaders on national issues. He passed away on March 23rd, 2015 from pneumonia. Singapore is one of the world’s successes stories, and Lee is the man behind it. Although many critics question his style of leadership and describe it as autocratic and dictatorial, Singapore’s meteoric rise as a city-state is undeniable. One of Lee’s most apparent qualities was his straightforwardness. He was not afraid to be blunt about what he saw as the truth. This approach came across as too abrasive for some. Still, the ability, to be honest, is key for a leader. The best thing you can do for your team is to acknowledge and speak the truth. It might ruffle a few feathers, but to allow your team to face reality is probably the best thing you can do for them. Although some might be offended or feel uncomfortable, you will gain a lot of respect for doing so. People know that they can trust you. Lee planned for succession years before he stepped down as Prime Minister. He saw the importance of grooming the next generation to lead the nation. As the saying goes, there is no success without a successor. Your organization must transcend you, and you must be humble enough to acknowledge that. Strive to build a team centered around a mission or purpose instead of an organization focused on you. Be generous with sharing your experiences and advice with the next generation of leaders that you are grooming. Equip them with the information and knowledge they’ll need to continue growing the organization. A great leader will ensure that those that step into his shoes have the best chance of success. Lee went through his toughest period during the separation of Malaysia and Singapore. Him shedding tears on public television marked one of Singapore’s most historic moments. However, even with this setback Lee never gave up. He strengthened his resolve and continued to believe that he could develop Singapore into what he envisioned it to be. A leader must have this resolve to press on no matter how difficult the circumstances. It is this quality that separates the good from the great. Anyone can lead well when conditions are favorable, but it is your conduct in times of adversity that distinguishes you as an excellent leader. Moreover, when you continually choose to press on, you will develop tenacity and persistence that will help you throughout your leadership journey. Follow The Rainbow. Yew chastised the generation under 35 years of age because they didn’t know the struggle that older generations in Singapore had experienced. They expected the same standard of living as a young adult, that their parents had worked their lifetime to achieve. Having strong economic growth year after year was something they took for granted. He was disappointed they were selfish. Unwilling to sacrifice personal and family wealth for the benefit of society. Yew cautioned those who would listen that this way of thinking was dangerous, as things can go wrong very quickly. He knew not all would be rich financially, but he knew that the entire society would be lifted up as a whole if everyone was striving to be better. Never Give Up. Yew was astute in delivering ideas to people. Instilling into them determination is the great equalizer. Not giving up and focusing on finding the solution to a problem. If you are not successful with your first, second or third try, try it a fourth time. Do not give up and focus on finding that solution because it is there. Be Open Minded. Do not fool yourself into thinking you can do everything yourself. Get help in areas where you are weak. Do not be afraid to say “I was wrong, this is not the way, we need to change course.” If you are prideful and close-minded, you will fail to achieve your potential because you refuse to abandon an idea or a course of action that is no good. Make The Best of Your Life. Everyone is dealt a different deck of cards in life. The DNA inside of you is fixed by your mother and your father. He would often joke that if he decided to be an artist, he would starve, for that was not in the deck that was handed to him. Do not do something that you were not favored by nature to do. Be Passionate! “Whoever governs Singapore must have iron in them or give it up. This is not a game of cards; this is your life and mine.” He was a strong leader with a great deal of passion and admonished others to have the same fiery passion for what they did. Stand Your Ground. You have so much at stake in your life, your career and your family to afford to be intimidated on any level. Always stand your ground. Show Effort. The current generation does not understand what it is like to be poor. Yew realized this, and instead of living in the palace, he stayed at the home he and his wife had to bring up their children to be self-reliant. He believes if you do not make an effort, you can end up back where you were. Learn From Your Own Experiences. You will fail. It is part of life. Learn from your own experiences and do not make the same mistake twice. Do not dwell on the past, but look to the future with a clearer mind and an understanding of what does not work. Be Consistent. Three journalists analyzed 40 years of speeches from Yew, and they found the consistency to be the prevailing trend. It was not that Yew was immovable in his thinking, quite the contrary, but his passion, his love of the Singapore people, his worth ethic, etc. was consistent. In other words, he did not work harder in an election year; he worked hard every day. Dedicate Your Life To Something Great. Yew dedicated his life to making Singapore great after it split from Malaysia. He would often say he was no one’s stooge. He devoted himself to making Singapore better for each generation. And he succeeded. Who is known as the father of Singapore? Of course, it is Lee Kuan Yew, known as “The Founding Father of Singapore.” He not only transformed a small “outpost” that was largely forgotten by the world, into one of the least corrupt and wealthiest countries in Asia. If it weren’t for Yew, Singapore would look vastly different than it does today. What are the religion and religious beliefs of Lee Kwan Yew?